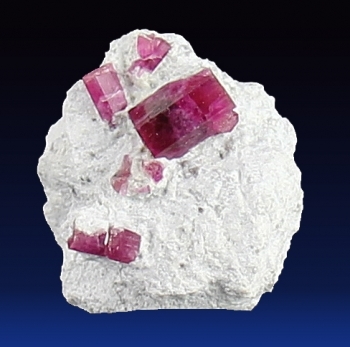 Red Beryls are getting very difficult to find on the market, as there is little to no mining occurring. The beryls here are rich and bright. 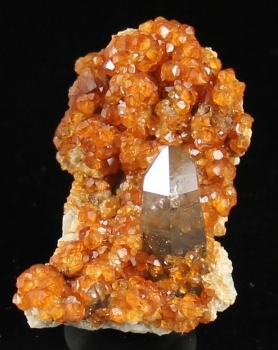 The largest crystal is double terminated and measures 1 full cm. 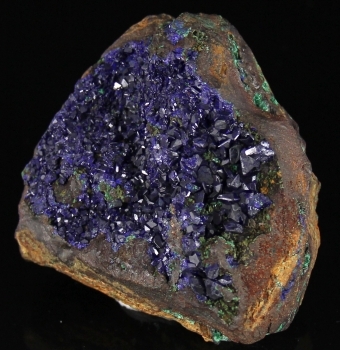 This largest crystal has a deep-colored transparent section to it. No damage. 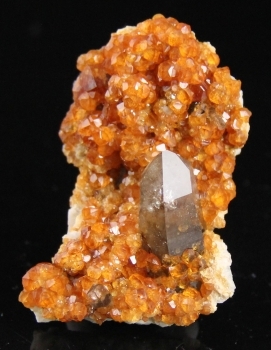 I just acquired this from John Rakovan, who for years has lead research digs to the various mines in Bingham, NM. 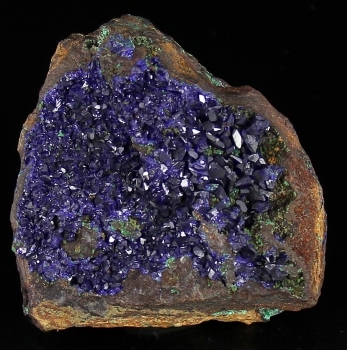 Fluorite is the primary mineral found, and Linarite is quite rare. 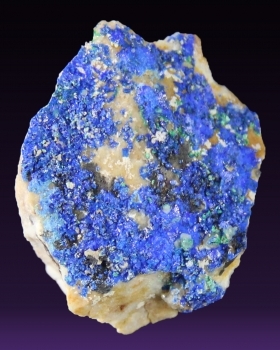 This one has a distinct rich blue color.It comes with his label. 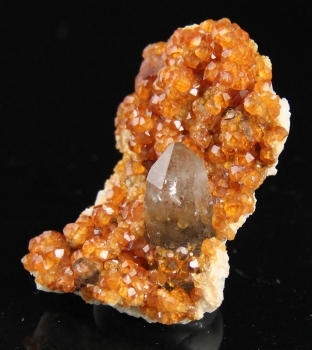 This aesthetic piece has bright transparent orange garnets surrounding a single vertical, glassy smoky quartz crystal. It's a great example from this location, no damage. 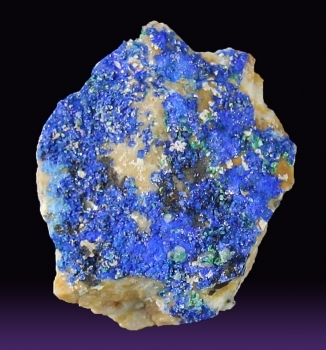 Mined in the seventies, this classic example of Morenci azurite is sparkly with rich color saturation. 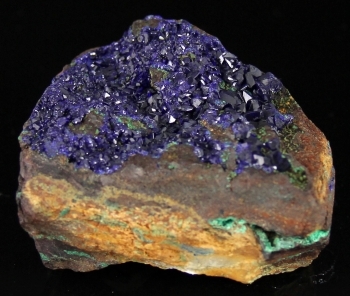 You can see a mid layer of drusy Malachite. It weighs 249 grams. There are a few cleaved crystals out of the hundreds on the piece. TOURM47 - Tourmaline Var. 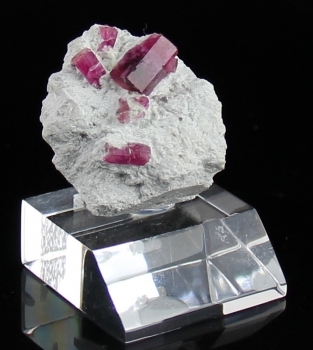 Tri-color Elbaite "scepter"
This gorgeous Tourmaline is so ideal, it's what everyone looks for in a tourmaline crystal. It's 99% facetable, so the crystal glows a beautiful shade of green and blue. It has a long slender length wtih a bright pink stem. This was part of Luis Menezes collection for years, he got it from Jon Das Mosas. The termination is trigonal and complex at the very tip, the body is pristine, even the stem is terminated. There is one face where the green part wraps around the pink stem where there is rough underside edge, instead of a re-healed edge. It's technically a tri-color double terminated scepter. It weighs 11.83 grams.